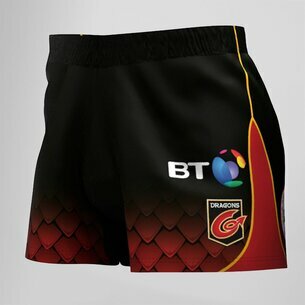 Show where your loyalties lie in training, on the streets or even at the Rodney Parade in these Dragons 18/19 Alternate players shorts from VX-3. Core Playing shorts are made for training or playing on the pitch. Featuring an elasticated waist with an adjustable drawstring to create a secure fit. These shorts come in royal blue with the faded dragons scale design to match the alternate shirt with the VX-3 logo on the right, as worn and the club's crest on the left. The back of the shorts feature the club's sponsors.